Properties in Paderno Dugnano average 4.2 out of 5 stars. Property 20: Residential flat, characteristic "casa di ringhiera"
Property 28: Blue Grotto ★ Sleeps 5 ★ BEST Location in Milan! Property 29: Hospitable and very close to "The Last Supper". Property 44: Feel at home in the center of Milan: near Corso Como, Brera, Gea Aulenti square. Thanks for everything! 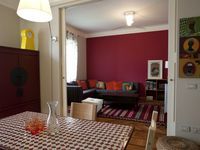 The Appartement is clean, perfectly located and with its hight ceilings very spacios. We were late with the check out. Sorry for this and thank you for your understandig! Everytime again! Great space! VERY quiet and EXTREMELY secure! Within walking distance of all sites and Metro. We enjoyed 4 days here. Very quiet, extremely secure. Ten minute walk Milano Centrale. Walking distance to most sites and Metro. Main Street is 2 blocks down. Would definitely recommend!! !